Habit: Scaevola taccada grows as shrub to 4 m occasionally rooting at the nodes when buried by sand to create large hedges. The leaves are arranged alternately to 25 centimeters long and 10 centimeters wide, with a notched leaf apex. The blades are ovate/obovate/oblanceolate. There are white hairs in the axils and branch tips. The complete, perfect, zygomorphic flowers are in cymes arising in leaf axils. The calyx has 5 fused, green sepals subtended by 2 bracts. The corolla splits forming an apparent half flower appearance and has 5 fused pinkish white petals covered with hairs at their base. There are 5 functional stamens fused to the side of the corolla. The inferior ovary with 2 locules and 2 ovules. The fruit is a drupe turning white at maturity. Habitat: Scaevola taccada grows in Dunes and Human Altered Environments. Distribution in Bahamas/Globally: Scaevola taccada is native to the South Pacific and Hawaii. Now occurring as Non-Native Invasive throughout the Bahamian Archipelago, Caribbean, and Florida. 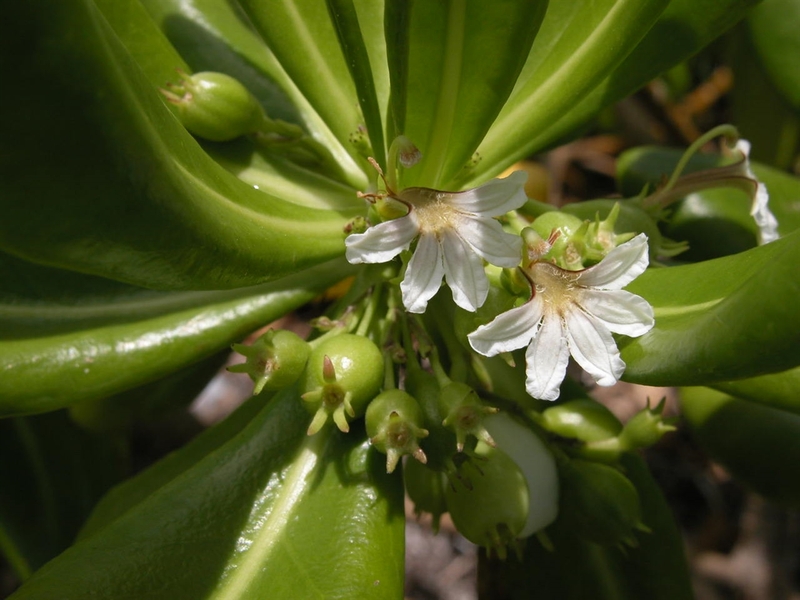 Medicinal/Cultural/Economic Usage: Scaevola taccada is not used medicinally in the Bahamian Archipelago.